Links for the download of digital products will be provided immediately after your payment is approved. Payment approval usually takes just seconds. You may then immediately download the purchased digital products using the links you will be provided with. There are no shipping charges for any of the many digital downloads at PuritanDownloads.com. This means that no matter how many digital downloads you order, and no matter where you live in the world, you will get free online delivery of every digital download you purchase. Is that not a great deal? You get free shipping combined with ultra-low SWRB prices on all the digital downloads for all the great Christian (Puritan, Reformation, Covenanter, Reformed Baptist, etc.) resources (books, MP3s and videos) that are available to you at PuritanDownloads.com (SWRB). We ship all orders for non-digital download products within 10 business days after they are received (for items in stock) whenever humanly possible - though, of course, prepublication resources (which will be clearly marked as such) can only be shipped after they become available. We also place all backorders at the earliest possible date, though receipt of these items is sometimes delayed. Many reasons for potential delays exist, including books being reprinted, customs delays, delays from suppliers, etc. Nevertheless, please be assured that we are committed to getting your orders into your hands as soon as possible, even though delays sometimes occur which are out of our control. Most shipping originates from the United States, though, to serve you better, sometimes shipping may originate from Canada or other countries. Some non-digital download products at PuritanDownloads.com have shipping and handling charges and some do not (i.e., we pay the shipping and handling charges for these non-digital download products so you get the shipping and handling for free!). Most notably, if you buy before the price guarantee expires, you will not only get a much lower price on the Puritan Hard Drive, but you will also get free shipping and handling to any country in the world! When non-digital download products do have shipping charges, you will see the total shipping costs in your shopping cart before you confirm your order and pay for your purchase. This gives you total control over what you are buying, including the knowledge of the exact shipping charge (if any) before you buy. You are responsible to pay any customs, taxes, etc., or any other related fee that may be charged by entities other than SWRB concerning the delivery of products you have purchase. We give you a 100% iron-clad guarantee that we will make sure that you obtain any digital download(s) which you purchase from Still Waters Revival Books (SWRB), and the Puritan Hard Drive, in technically perfect working order, so you can rest assured that we will make certain that any digital products you purchase from SWRB will be delivered to you as advertised. The SWRB Puritan Hard Drive comes with a 90-day hardware warranty. If the drive fails because of manufacturer defect under normal usage, you may return the drive to us and we will replace the defective unit with a fully-restored comparable drive free of charge. If the drive failure is determined, in our sole discretion, to be caused by user misuse, abuse, accident, neglect, or improper installation, connection, or maintenance, we will provide a comparable fully-restored replacement unit at a cost of $125.00 (this fee includes return shipping to you and is implemented just to cover some of our costs). Furthermore, should you experience problems with the Puritan Hard Drive even after the 90-day warranty period, we will make our best effort to provide you with a fully-restored comparable drive at the lowest possible cost. 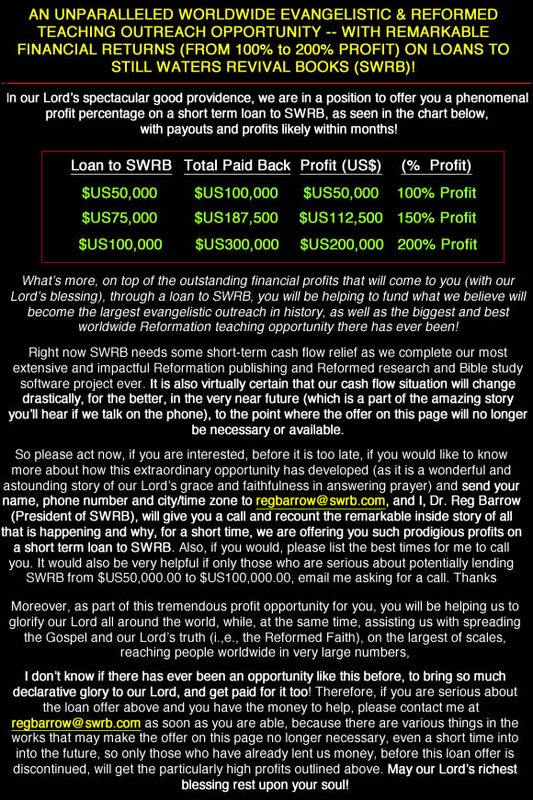 It has always been our goal at SWRB to make ministry a priority, to be a blessing to you, and to glorify God in the process - and we want you to be able to benefit from the Puritan Hard Drive for the rest of your life. Essentially, once you have purchased the Puritan Hard Drive, we will work with you, even after the warranty period, to make sure that you have a technically pristine working copy of this amazing and unsurpassed Christian study and growth tool until the day you pass from this world to the next (Hebrews 9:27). How is that for a true life-time guarantee on the Puritan Hard Drive! Thank you for your purchases and don't forget to backup your downloaded digital files and the Puritan Hard Drive. Also, please remember that virtually all the digital files offered by SWRB are protected by international copyright laws. There are many reasons for this, among them are the custom work we have added to the files (like contemporary prefaces and notes, embedded and appended indices, etc. ), the copyrights of the original authors from whom we have obtained permission to include their works in our offerings, and many other reasons. A lot of time, effort and money, over the last 25 years, has gone into providing these files to you at the lowest prices possible (and free) and in most cases with great, new, additional study features (like embedded and appended indices we have added to most of the SWRB published book files). Moreover, each time someone illegally copies and/or shares any of the copyrighted digital files we sell, which would have otherwise been purchased, this limits our ability to find and digitize even more resources for you in the future - the great majority of which we give away for free (see "About Us" for more details on all the free ministry resources that are published and distributed, by God's grace, through SWRB). Also, as we are sure you know, stealing is a violation of the eighth commandment (Exodus 20:15), even if it is done digitally and many people are doing it (Exodus 23:2). We strongly encourage users who do not require the portability the USB external hard drive provides, to transfer the application software and digital resources on the Puritan Hard Drive to a more secure internal drive either in their desktop or notebook computer. We will include, on the drive and online, an instructional video to walk the user through the simple and straightforward transfer process. As with all data that resides on storage devices, we highly recommend the use of off-line (Windows Backup. Mac OS X Time Machine, etc.) or online storage services like SOS Online Backup, Carbonite, Mozy, etc., to back up the full contents of the Puritan Hard Drive. Ultimately, the choice of backup methods you employ is your decision and your responsibility. The rare books included on the Puritan Hard Drive and among our digital download offerings have been digitally scanned from various sources. Though every effort has been made to obtain the best possible copies, we are still dealing with older, and sometimes the most rare of titles - so our choice of editions can be very limited. Because of these "real-world" (i.e., non-digital) limitations, there are cases when the best we can produce may still contain some imperfections or blemishes which were present in or on the original editions. Be that as it may, and in the interest of making these great Christian classics available to the largest possible audience, at exceedingly reasonable prices (most SWRB published digital downloads are now just 99 cents each and some are even less, in spite of the fact that some of these books sell for thousands of dollars each on the rare book market), we have made these books available to you using the best copies we could obtain. Moreover, we remain committed to bringing you the best quality scans (and files) we can obtain and we have already upgraded some of the rarer books two or three times (or more). One very rare and important volume, Samuel Rutherford's Free Disputation Against Pretended Liberty of Conscience, has actually been upgraded five times over the past couple of decades, as better editions were acquired for digitization by SWRB. In short, even though we occasionally encounter reproduction issues beyond our control, it is because these works are of the greatest spiritual and theological value and significance that we have made them available to you. This is a part of our continuing commitment to protecting, preserving and promoting the best Puritan, Reformed and Covenanter literature, while we pray (and ask that you pray will us) that God will once again use these books to further the Third Reformation in our day. Physical products that are shipped may be returned within 7 days of receipt. Returns must be pre-authorized by calling 780-450-3730 or emailing support@puritandownloads.com. Upon receipt of the unwanted product with a valid return authorization number, we will process your refund through either a credit to your charge card account, an in-store credit or product exchange, as per your request. To obtain a credit or product exchange, returned goods must be returned in the same condition in which they were shipped as we cannot offer refunds on damaged or defaced products unless the damage can be shown to have been caused in transit to you. For purposes of our return policy, the Puritan Hard Drive is considered a digital product and not a physical product, and is dealt with below. All sales of digital products are final. However, with respect to the Puritan Hard Drive - On Demand Edition (PHD-ODE), if you should determine that the original USB-based Puritan Hard Drive (PHD-USB) is a better match for your particular usage requirements, we will allow you to upgrade to the PHD-USB. Please contact us at support@puritandownloads.com for more information. Special sale prices and offers cannot be applied retroactively to previous sales. We reserve the right to change the prices of our products at any time without advance notice. Digital products are defined as any digital download and the Puritan Hard Drive. Due to the fact that our digital files have not been copy-protected (for the convenience of our customers), we cannot issue refunds for such digital products. Regarding digital downloads, customers will have the opportunity to download the digital files within 5 days of purchase. In the event that the files were corrupted during the course of transmission or they were never successfully downloaded during the 5 day download period, you may send a request to customer service at support@puritandownloads.com and upon approval, your download period will be extended.